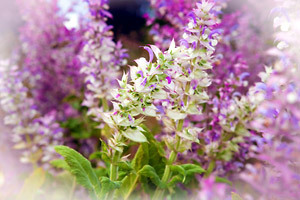 Clary sage essential oil is obtained from the flowers and leaves of the herb Salvia sclarea. This herb belongs to the Lamiaceae family (previously known as Labiatae), and is also known as clary wort, clear-eye, clarry, and muscatel sage. This herb is widely cultivated throughout the temperate regions of the world, but the largest clary sage oil producing country by far, is Russia. Other countries currently exporting the oil include Bulgaria, Hungary, Italy, Ukraine, United Kingdom and USA. Many connoisseurs believe the English and French clary sage oils are the finest, although admittedly they are usually the most expensive due to the cost of labour. Native to southern Europe and the Mediterranean region, Salvia sclarea is a handsome, erect herbaceous biennial that can attain a height of 1.5 metres (5ft) under cultivation. The broad oval or heart-shaped leaves are wrinkled and covered with silver-white woolly hairs, and grow in pairs from a central stalk that bends under the weight of the attractive flowers. Depending upon the origin, these flowers may be violet, lilac or pale blue and are arranged in whorls forming a shape like a spike which produces a striking appearance. The whole plant is aromatic. During the Middle Ages the herb clary sage was highly regarded throughout Europe for its astringent, antispasmodic and carminative properties, and was used to relieve a wide range of gynaecological conditions including menstrual cramps, delayed and painful menstruation, plus complaints associated with menopause such as hot flushes. A favourite with midwives, it was used to induce labour or strengthen contractions during childbirth. Clary sage tea was used to ease digestive and kidney conditions, to protect against infections of the mouth, and as an eyewash. In his ‘Complete Herbal & English Physician’ (1653), the herbalist Culpeper refers to clary sage as ‘clear eye’ due to its reputation for successfully treating problems in the eye. After soaking for a few minutes, clary sage seeds form a thick mucilage which can be used to remove small foreign particles from the eye, and the same mucilage was used to draw thorns and splinters from the skin, reduce inflammation, and heal tumours. Culpeper used the leaves in a mixture of honey and boiled vinegar to treat various skin infections and for weak backs recommended eating the fresh leaves ‘dipped in a batter of flour, eggs, and a little milk, and fried in butter, and served to the table’. The flowers and leaves of clary sage are collected at the end of blooming when the level of volatile oil in the plant is at its highest. The cutting and bundling usually takes place during the afternoon at which time the level of oil is at its daily peak unless it is too hot and sunny, raining or foggy; heat vaporizes the oil and excess humidity lowers the yield. Any woody stalks are removed prior to charging the still since they contain virtually no oil, and because the yield is quite low via steam distillation (0.15% to 0.4%), it is processed quickly to avoid the loss of precious oil by evaporation. Freshly distilled clary sage essential oil is colourless to pale olive with a tenacious warm, balsamic, sweet-herbaceous aroma that has characteristic nutty, woody and tobacco-like nuances. A concrete and absolute of clary sage is also available, and these are used in soaps, detergents, colognes, perfumes and skin care fragrances to provide tenacity and act as a fixative. Clary sage oil has a surprisingly wide range of uses, and with its natural affinity with the female reproductive organs it is surely one of the most important essential oils for a woman. It provides relief and support through all the reproductive and hormonal phases of her life; antispasmodic properties help relieve period cramps, an emmenagogic action regulates scanty periods, its calming action is invaluable for PMT, and studies have shown it to ease pain during labour. There is a popular misconception that emmenagogic essential oils are unsafe during pregnancy because they are abortifacient and may lead to a miscarriage. This is incorrect, and in ‘Essential Oil Safety’(1) Tisserand states that emmenagogic oils present no danger in aromatherapy, and clary sage is listed as safe (when used externally) during pregnancy. This misunderstanding has been exacerbated due to S. sclarea being confused with S. lavandulifolia – which is an abortifacient. During the menopause, clary sage essential oil relieves the excessive perspiration associated with hot flushes and imparts a balancing and strengthening effect, perhaps due to the oils oestrogenic-like action. This is a powerfully relaxing oil on both body and mind, which together with its renowned ‘euphoric’ effect makes it invaluable with all types of anxiety, depression and stress. Aromatherapists always advise clients not to take alcohol after using a high percentage of clary sage in treatments since it is reputed to increase the effects of alcohol. When used in skin care this oil brings useful anti-aging properties, and on the mind it helps with the grieving process and dispels negative thoughts and emotions. Essential oil of clary sage blends well with many other oils, including bergamot and all citrus oils, chamomile roman, coriander, cardamom, cedar atlas & virginian, cypress, geranium, lavender, linaloe wood, neroli, petitgrain, rosemary, sandalwood, vetiver, and ylang ylang. (1) Tisserand & Balacs, Essential Oil Safety, Churchill Livingstone (1995), Emmenagogue oils: p110-111.